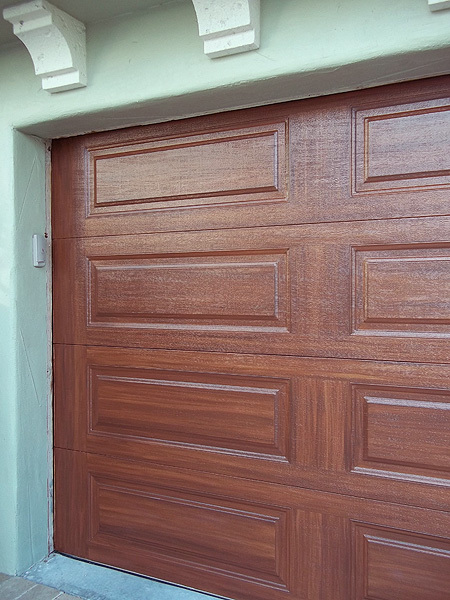 What is the base color you used on this door. This looks more like my front door which I would like to match to my garage. amazing work. I am inspired to give it a try. What color brown? Java? Or Firey brown? Terra brun? This is my favorite door you've done. I think because it has a lighter tone and a little more variation in you wood grain. 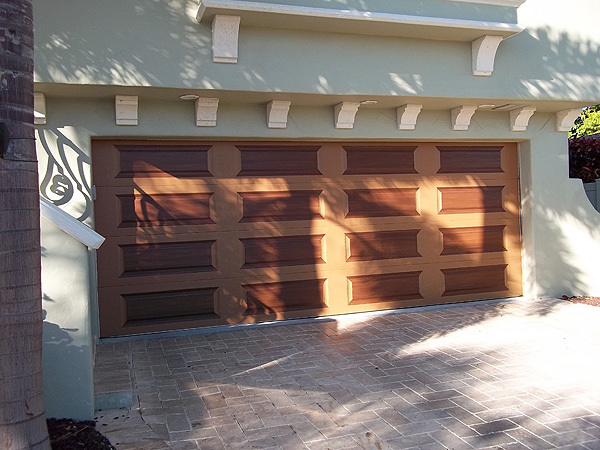 I mixed Jave and Terra Brun together for these doors because I matched the existing front door and I needed to do that to get the color right. Send me a picture of the door so I can see what you have and maybe I can recommend something. 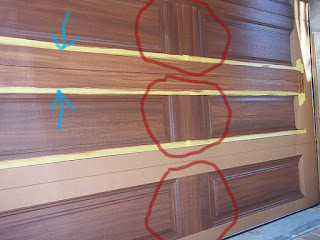 When I want a really rich mahogany look I use Sherwin Williams color True Penny for the base coat, then the first coat of brown I use Fiery Brown and then Turkish Coffee on that for the second and darker coat of Brown. No glaze or extenders involved? How about a wood graining tool? Would those doors look weird if you did everything on the vertical? I do not use any glaze, I only thin with water. I use a brush for the wood grain because it looks like a high quality wood grain when I use a brush. Those wood grain tools work ok on a smooth surface but make the wood look like a lesser quality of wood cut. If that the look you are going for then they are ok. Like a more rustic, country type of look. 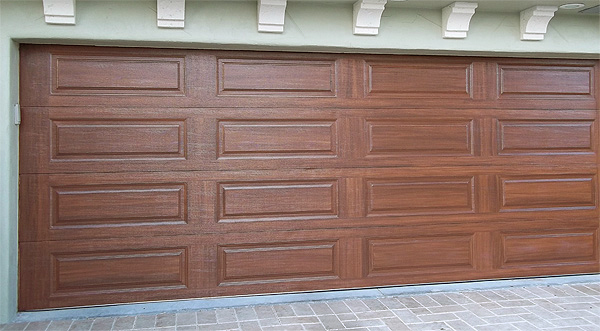 When you look at good expensive quality wood doors you don't see a grain like the wood grain tools give you. But like I said sometimes you might want that look. A vertical grain across all the door would not look good to me. 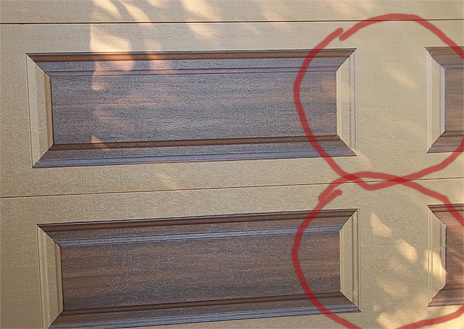 I have seen where sometimes people have just used a horizontal grain across the whole door however. But my reasoning behind the way I paint the grain in is that if the door were indeed made with real wood door, then the way I paint the grain is the way the grain would be. 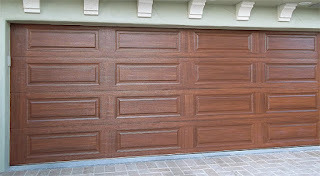 I sell a complete step by step tutorial on how to paint a garage door to look like wood on this site. You can find it in the menu bar above. On the final coat (Terra Brun) did you dilute with water? If so, what ratio do you recommend? The base coat for these doors was SW Toasty as i remember. Then the first coat of the wood grain color is the Terra Brun. I watered that down about 20% water, so quite a bit. The second and darker coat of wood grain was SW Turkish Coffee and I actually watered that down even more. Hope this helps. This helps very much so. Thank you!